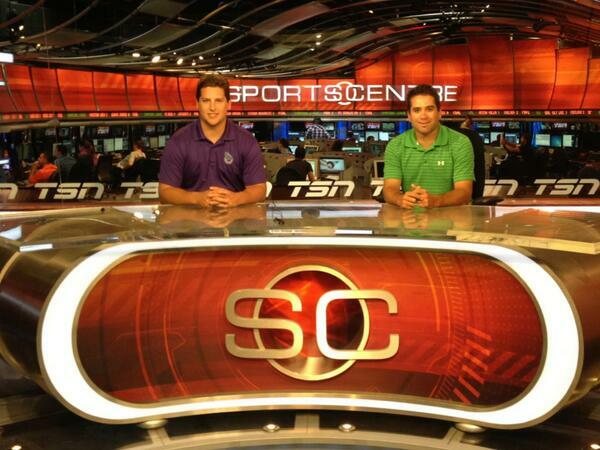 Cory Vitarelli and Shawn "Shawny" Evans sat behind the TSN SportsCentre desk today (August 22nd), where they were there to do an interview for the Top 20 Lacrosse Plays of 2013 which will air on TSN in the Fall (late September/early October). They are both born and raised in Peterborough and both play for the Lakers. Cory also plays pro for the Rochester Knighthawks, where his team just won their second Champion's Cup in a row. Shawny plays for the Calgary Roughnecks, where last season he set the Roughnecks single season record with 112 points and was named the league's MVP. The coolest thing about Shawny right now though is what he's doing off the field; he and Lakers' teammate Brad Self co-founded Nationwide Lacrosse and they are currently travelling around teaching kids lacrosse at the grassroots level. Learn more at Nationwidelacrosse.ca.